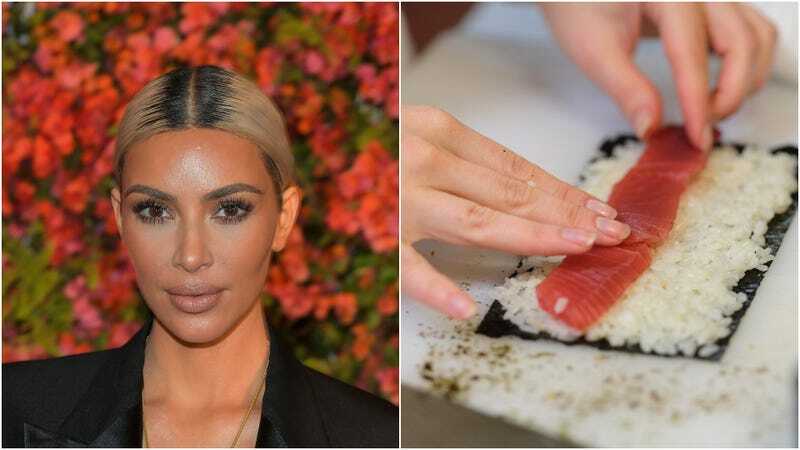 A few days ago, Kim Kardashian took a break from snapping mirror selfies and hawking her cosmetics to post an innocent Instagram story of a culinary creation she assembled for her kids, dubbed #hotdogsushi. Over an image of cut-up hot dogs wrapped in rice and nori, she wrote: “When your kids LOVE sushi & hotdogs, you get creative #hotdogsushi.” Twitter backlash was swift—and completely unwarranted. Internet, leave Kim K. alone. Hot dog sushi, while not the most appetizing term for this creation, is completely a thing in Hawaiian and Korean cultures in the form of Spam musubi and gimbap, respectively. Spam musubi is compromised of a slice of grilled Spam atop rice, secured with a nori belt. Gimbap is a bit broader, as the rice-and-seaweed roll can include multiple fillings, but lunchmeat is a popular option. So stop picking on Kim K., who is just introducing her kids to an age-appropriate version of global foods. If this is what it takes to acclimate kids to sushi, then we say: go for it. Let those who’ve never served a kid cut-up hot dogs in a bowl of boxed macaroni and cheese cast the first stone.